Jamar Charles (centre) receiving his scholarship cheque from Liley Cato (right) of Tus-T Water. At left are Jamar’s parents Mark and Jasmine Charles. Jamar received a 7-year scholarship from the Norma Keizer Scholarship Foundation sponsored by the ‘Start Bright’ initiative of Tus-T Water Inc.
A corporate donor to the Norma Keizer Scholarship Foundation (NKSF) has once again demonstrated its generosity through the offering of a seven-year scholarship to a deserving student. 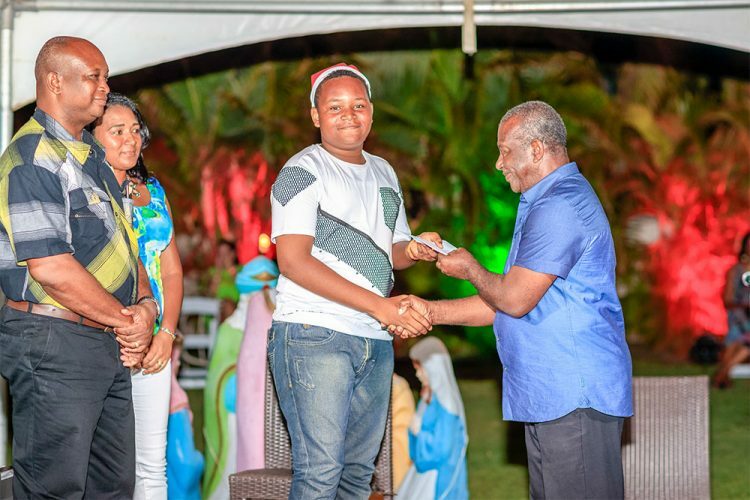 Tus-T Water, through its ‘Start Bright’ initiative, presented the scholarship valued at $10,600 to first form student, Jamar Charles during ‘The Ultimate Christmas Experience’, a fundraiser held for the NKSF last Sunday at the Bungalow at Villa. Charles was one of several students who received one-off bursaries from the Foundation earlier this year. He began his education at the St Vincent Grammar School in September having placed 13th for boys and 31st overall in the Caribbean Primary Exit Assessment (CPEA). “…You will receive $1400 a year for forms one to three then $1600 a year from form four to the Community College,” she continued. The scholarship award was presented to Jamar, in the presence of his parents Mark and Jasmine Charles, by Liley Cato of Tus-T Water. Keizer thanked Dwight Hillocks of Tus-T Water, whom she described as a person with a “really, really big heart,” and she expressed gratitude to him on behalf of the Foundation for his generosity.